The most widely adopted digital currency is Bitcoin. Some of the other digital currencies include Litecoin, Dash, Zcash, Peer coin, Monero, etc. The term “meta coin” is used for second-layer systems that use irreversible open ledgers such as Bitcoin as a fuel for transactions conducted using the second-layer. Examples of applications with second layer systems include Colored Coins, Mastercoin and Namecoin. Some other applications allow for exchange of heterogenous on/off chain assets such as currencies, metal, stocks or bonds. Examples of these include Stellar, Ripple, and Hyperledger. Several other applications for blockchain are being tested. These include shaping identity verification, forecasting, transactions, record management, registers and contracts. For instance, blockchain is being tested for streamlining supply chains, speeding up payments, and managing records in retail. The term “smart contracts” was coined by Nick Szabo1, a computer scientist and legal scholar. Szabo proposed that decentralized ledger technology could be leveraged for smart contracts. In simple terms, smart contracts allow the participants to enter into agreements and automatically carry transactions, without the need for a third party. For example, Ethereum’s blockchain protocol features a smart contracts framework. The global blockchain market is estimated to grow to 16 billion USD by 2024 with a CAGR of 75% according to a recent report by Global Market Insights, Inc2. Businesses around the globe are also spending big on blockchain with one report estimating venture funding at 4.1 billion USD for the year 20183. The current market share is dominated by IT companies like IBM, Microsoft and Accenture4. The banking, finance and insurance sector is expected to contribute to the bulk of future growth followed by other sectors such as healthcare, government, media and entertainment, retail, transportation, real estate, etc. Patent activity has been suggested as a proxy for innovation and can provide insights into R&D intensity, collaboration and market focus. For the current analysis, we tapped into a variety of databases available to us to conduct a comprehensive search of US patents relating to blockchain technologies. The patent search yielded 1,878 unique records filed in the USA since 1999. 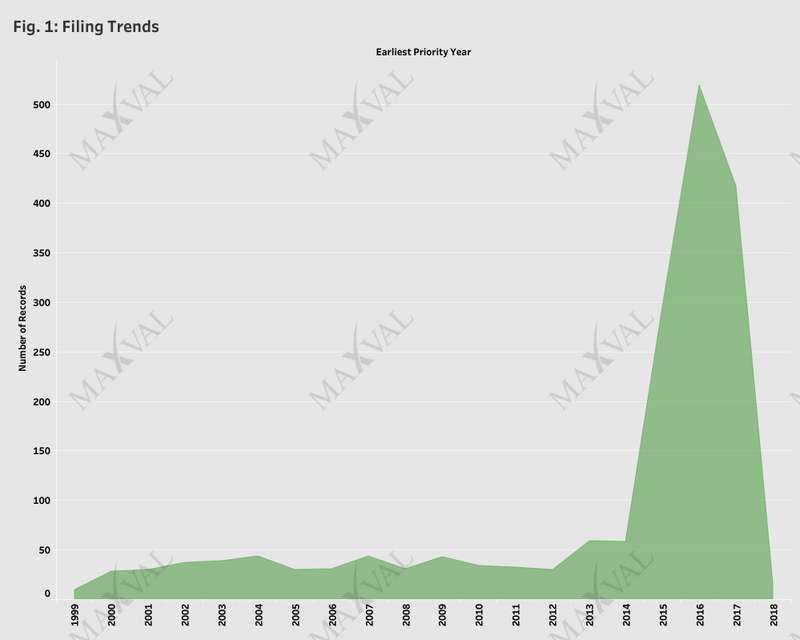 The number of patent filings in the USA related to blockchain innovations have increased exponentially since 2014 indicating this is an area of strong growth (Fig. 1). Most of the filings originated in the USA (Fig. 2). 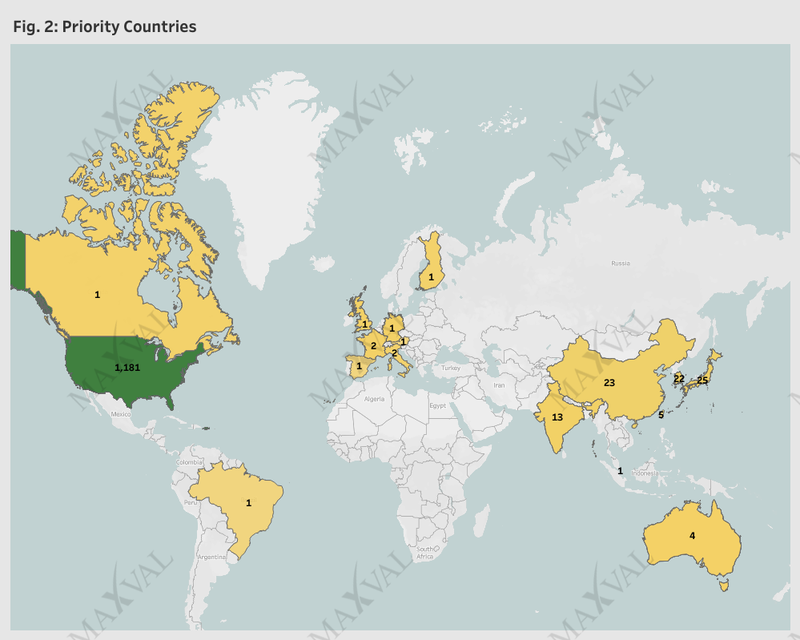 However, there is an increasing trend of seeking blockchain patents following a first filing in Asian countries such as China (eg: Alibaba), Japan (eg: Hitachi, Fujitsu, Sony), Korea (eg: Coinplug, Samsung) and India (eg: Tata Consultancy Services, Wipro). The patent filers are predominantly in IT, financial or fintech space. There is also an increasing interest from other sectors such as e-commerce. The top 20 filers are IBM, Mastercard, Microsoft, Bank of America, Intel, Accenture, Samsung, Walmart, Cisco, TD Bank, Coinplug, Cognitive Scale, Fidelity Investments, Alibaba, Sony, Fujitsu, JPMorgan Chase, Security First Corp, Dell, and Qualcomm. Some of the emerging players include Visa, Shocard, Civic, Factom, Monegraph, and Northern Trust Corp. Assignees with most granted US patents include IBM, Microsoft, Bank of America, Accenture, Cisco, Intel, Fujitsu, Security First Corp, Adaptec, Winklevoss, Mastercard, Amazon, Qualcomm, Marvell, and Samsung (Fig. 3). The applicants represent a good mix of large established companies and relatively new companies. Our analysis reveals that about 4% of applicants were listed as micro entities, about 34% were listed as small entities and about 61% were undiscounted entities (Fig. 4). The USPTO art units handling blockchain applications mainly fall within the business method groups 3680, 3690, 3620 and the cryptography and security group 2430/2490 (Fig. 5). The top 3 art units for blockchain applications are 3685, 2491 and 2436. Our analysis indicate Blockchain applications represents a very small portion of the applications handled by these groups. Most of the blockchain assets identified in the present study were filed between 2014-2018. 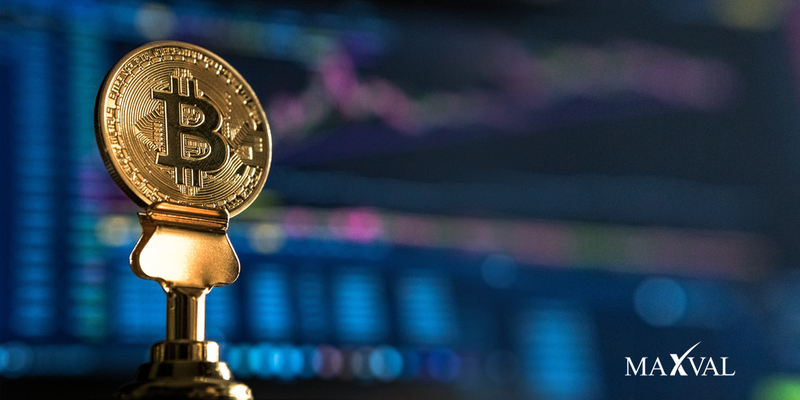 The art unit 2491 (cryptography and security) was assigned the most blockchain applications in 2018 (Fig. 6). The business method groups 3685 (business cryptography) and 3693 (finance, banking and insurance) were positioned second and third for assignment of 2018 blockchain applications. There was also a notable drop in applications assigned to the art unit 2436 (cryptography and security) for the year 2018. 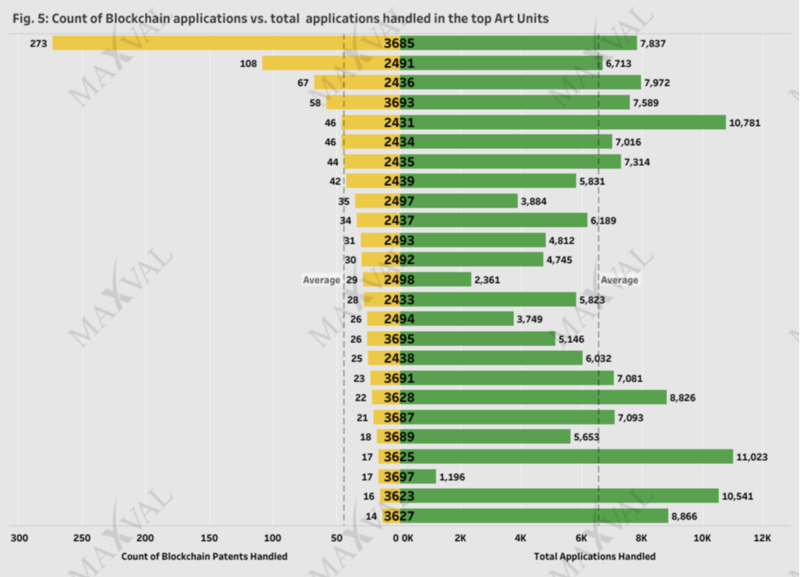 Blockchain applications were granted within an average time of 3 years as compared to an average time of 4 years for all the applications in the art units (Fig. 7). 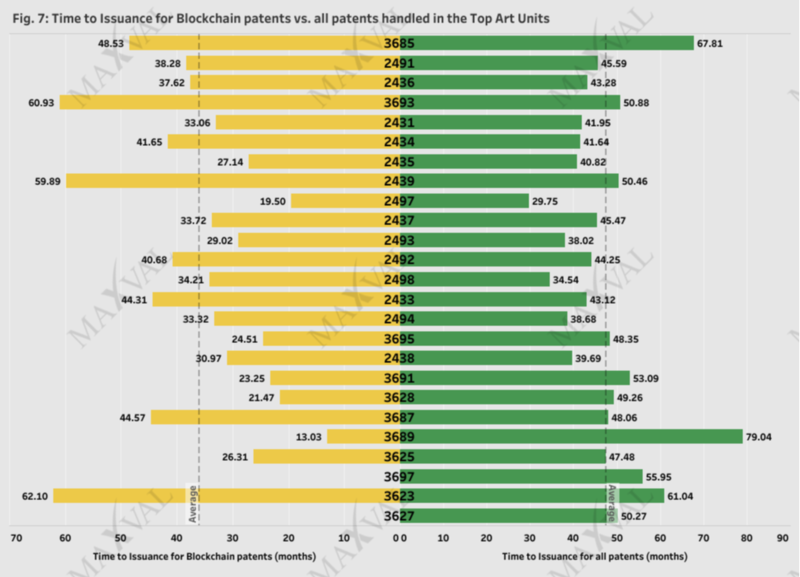 Most of the blockchain applications are under prosecution as illustrated by higher pendency and low abandonment for the top 10 art units (Fig. 8A). 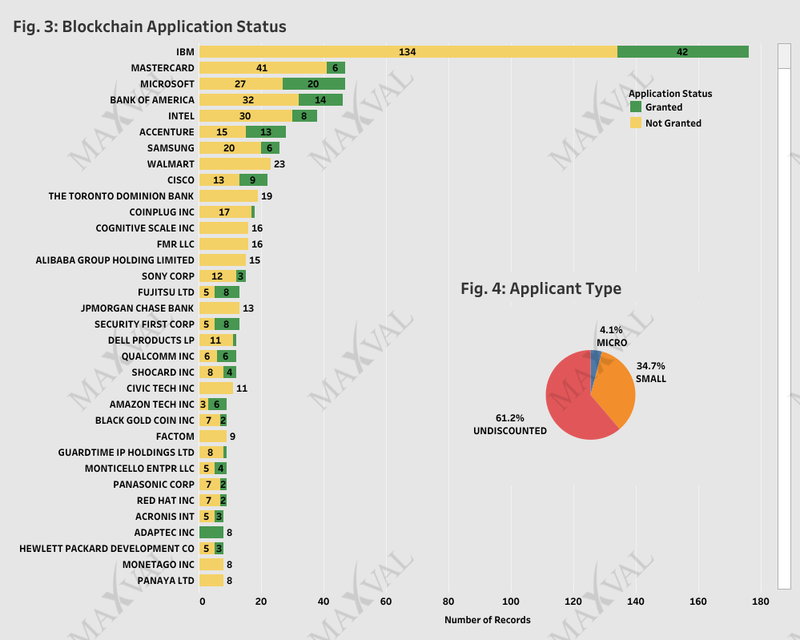 The business method art units, 3685 and 3693, have >90% of blockchain applications listed as pending. The higher pendency may be indicative of the longer prosecution time for these art units. The 3Y grant rate of all applications for these art units were 20% (3685) and 32% (3693). A significant number of blockchain applications were granted in cryptography and security art unit groups 2430/2490. A similar pattern was also seen for all applications handled by the art group units (Fig. 8B). Unsurprisingly, the 3Y grant rate of all applications for the 2430/2490 art group is about 76%. The aggressive patent filings in this sector, by a variety of players, is indicative of a fast growing landscape. 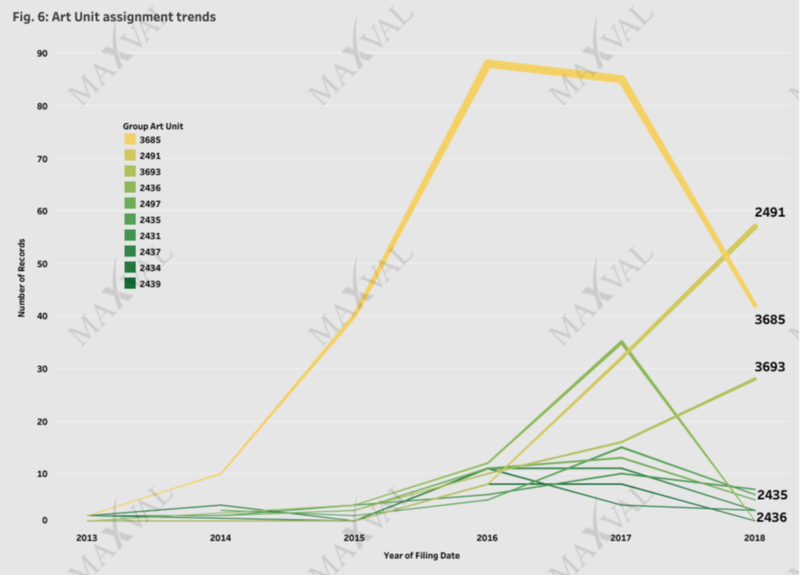 Understanding the patent filing, prosecution and litigation trends is important for developing individual, collaborative and industry-wide patent strategies, staying ahead of competitors and reducing the risk of patent assertion. For more blockchain patent filings and prosecution trends, visit the LiveScape Reports section on our Patent LiveScape page.